Two days of fog, storms and rain kept me off the computer, along with some work that I had been putting off. So I took the opportunity of wet weather to dive into getting books out of boxes and onto shelves in the sitting room. When I get it done it will be easier to find the books that I sell and also have them more accessible when we start up the shop. In between thunderstorms I hurridly priced a few more books and got a few items up on Tias.com. But the weather did not cooperate! Bunnies are doing well despite the cooler weather. All of the older bunnies are out of the nest box now, huddling together during the cool nights and scampering around the cages. Moms use the tops of the turned up nest boxes to retreat from demanding bunnies now. I have one new litter from the weekend, Living Waters Farm Angel produced a lovely litter of seven from a breeding with ISeeSpots Elwood Blues. There are some blue bunnies in the litter, always popular! 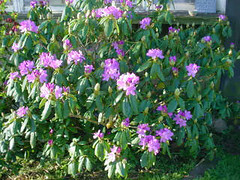 Th rhododendron are blooming in the yard. I haven't been up the Parkway to check, but just imagine the picture above multiplied by dozens of large green shrubs, covered with beautiful purple bloom. Here and there you'll see the blaze of flame azalea. This is the Parkway in late Spring! 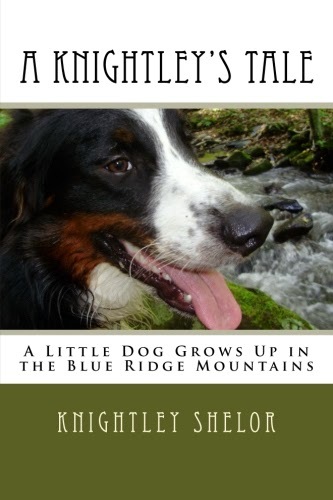 When I was a child people called the rhododenron mountain laurel. There is another shrub that is mountain laurel, but people called that mountain ivy. And the deciduous azalea, also known as flame azalea, was called honeysuckle by people here. The sweet smelling honeysuckle vine doesn't grow here. Last night I settled down to a little spinning, of some nice Cormo batts from a shepherd near Roanoke. I have never worked with Cormo before. Very soft and spins easy.